In spring 2010, Iceland’s Eyjafjallajökull volcano erupted, billowing an ash cloud so large it disrupted air travel in Western Europe for nearly a month. News stations scrambled to cover the event, and all eyes turned to Iceland, both praising it and admonishing it for its native geographic wonders. But once the ash settled, so did the attention. Once again, Iceland found itself inhabiting its own isolated region of the world. Iceland is a small country with a reputation built upon a foundation of misinformation. Few people have first-hand knowledge of the country, but many think they do. They spread the myth that Iceland is frozen over by glaciers year-round, that it’s barely inhabitable during the winter months. They harp that quirky Icelanders have a widespread belief in the existence of fairies. No wonder a musician as eccentric as Björk would spawn from such a curious land! These hastily-draw conclusions do not paint the whole picture. Iceland is certainly cold in winter months, but the famed landscape of eternal tundra is reflective of Greenland, not Iceland. Belief in mythological spirits certainly does exist, but Iceland is far from being an underdeveloped rural society of loons. The country’s most famous export, Björk, is considered unique by any standards. Her musical and aesthetic choices are hardly reflective of the conventional norms of the country, and your average Icelander is far from outlandish. Björk’s recent accomplishments have taken the form of collaborative projects with musicians like Dirty Projectors and Antony And The Johnsons. Ostensibly, her solo career has been deferred, and to fill in the void, the world has shifted towards Iceland’s other successful musical acts. Few and far between, those acts have wielded tremendous power, their sheer dearth providing them the opportunity to mold global perspectives on Icelandic’s music scene. Post-rock quintet Sigur Rós has, in the recent past, contributed to the rebranding of Iceland with a new visual and musical face — a move that has unwittingly opened the scene up to another slew of stereotypes and associations. Sigur Rós premiered their two-DVD film, Heima (“Home”), in 2007. Filmed after the band’s return from a worldwide tour, the documentary follows Sigur Rós as they embark on a short tour around their home country. More than a traditional music documentary, Heima features live performance clips of the band, spliced together with images of Iceland’s geographic highlights. Majestic time-lapse images of waterfalls and clouds floating over mountains serve as the perfect accompaniments to the band’s lush and largely instrumental music. And because it fits so well, a dangerous assumption has grown in the mind of the international music community. 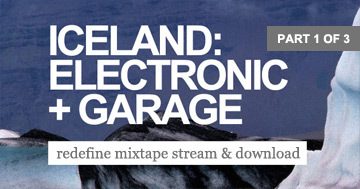 Iceland’s natural surroundings have become hard to separate from the “Icelandic” music style. Though Icelandic musicians embrace a wide array of musical styles, the ones known outside of the country — like Sigur Rós, múm and Amiina — all share much sonic similarity. It has become assumed that natural beauty is the singular, definitive influence upon contemporary Icelandic music. Talk to any Icelandic musician, and one will discover that this assumption is met with great skepticism and often, cynicism. Yes, Icelandic musicians are influenced by their environment, but what defines their environment is much more than a series of breathtaking postcards or video clips one might see on Planet Earth. To pigeonhole all Icelandic music as a living soundtrack for pondering life’s great mysteries would be foolish and inaccurate. With two-thirds of the country’s population living in the greater Reykjavik area, most Icelandic musicians are accustomed to city life more than anything else. Life is not spent herding sheep, breeding horses, or reading by candlelight; flats are shared with relatives and friends and powered by first-rate geothermal energy. Weekends are generally spent partying until the wee hours of dawn and soaking up the city’s infamous nightlife, not watching puffins mate on the Northwest coast. So, while Reykjavik is but a skip and hop away from the oldest geyser in the known world and the marvelous Blue Lagoon, the general consensus in the music scene is that nature’s influence is overstated. Perhaps, then, influences stemming from city life play the most impactful role. It all begins early on, in homes, schools, and communities.